Open University of Human Development "Ukraine"
Summary. The article describes the features of the application of the BCG model for insurance companies. For the enterprise IC «Knyazha» 10 basic insurance products were analyzed: transport insurance - product 1; medical expenses insurance - product 2; liability insurance - product 3; property insurance - product 4; cargo insurance - product 5; accident insurance - product 6; insurance abroad - product 7; cumulative life insurance - product 8; financial insurance - product 9; other types of insurance - product 10. Problems of using this methodology in the modern information society have been identified. Key words: insurance, economic security, competitive positions. Statement of the problem. In the face of increased competition, innovation activities are becoming one of the priority types of companies functioning. None of the business entities can implement an active policy in the market without the use of innovative potential. The main task of innovation management, as one of the conditions for improving the efficiency of its development, is to ensure its effective operation and development in the long term due to substantiation and choice of perspective directions of attraction of innovations, which significantly differentiate products (services) of the enterprise from competitors' products. So today, investing in innovative projects that provide the production of competitive products based on progressive means of organization and management are particularly relevant. And modern business conditions require enterprises to focus on analyzing and evaluating the prospects for innovation. Analysis of recent researches and publications. The problem of providing the economic security of the insurance company is still the subject of sharp scientific discussions, which indicates the complexity of this concept and the ambiguity of interpretation. The work of well-known foreign experts is devoted to providing the economic security of the insurance company in the sphere of the insurance industry: Rejda, G. E., Ocampo, J. A., Pearson, R., & Elson, D., Flannery, M. J., Wan, M.
Formulation purposes of article (problem). The aim of the article is to improve the methodology for evaluating competitive positions based on the use of the BCG model. The main material. Given that the main feature of the competitiveness of insurance companies is dynamism - the level of competitive position, regardless of the effectiveness of economic and financial activities can not be considered as a long-term characteristic of the competitive status of the enterprise. Therefore, in order to reflect the dynamic characteristics of competitiveness for the research of a competitive position, the use of matrix estimation methods is proposed. The essence of matrix methods is that the competitive position of analogue companies is reflected in the matrix of competitiveness under certain valuation parameters. The matrix of the competitiveness of insurance companies can be considered as a graphical interpretation in which each axis characterizes one of the parameters of competitiveness (single or multi-criteria system) and in a combination reflects the position of the enterprise in a competitive environment. One of the first models of development selection based on market share and industry growth is a matrix developed by the Boston Consulting Group (BCG) . The basic characteristics of the activity of the BCG matrix are its ease of use, differentiation and high suitability for strategy development. It allows to analyze the competitive position of the enterprise in the strategic zone of management, its attractiveness and prospects of economic development. The BCG matrix is determined by two coordinate axes, where the parameter "growth rate of the business sector" is estimated along the axis of the ordinate, while the abscissa axis is the "relative share of the business sector", reflecting the ratio of the turnover of the enterprise to the average value of the shares of the subjects of the competitive field. The feature of the BCG model is the accumulation of efforts in the research of cash flows of the enterprise, which are closely related to the growth rates of the market and the relative share in this market. At the same time, the BCG model has a number of disadvantages, in particular: a small number of analyzed factors; the parameters of model formation are not fully evaluated by the efficiency of the enterprise; the reasons for the occurrence of economic events are not investigated; there are doubts about the "idealized" balance of the economic portfolio from the position of cash flows of the enterprise [2-6]. for enterprises that are barely established in fast-growing industries, direction choice is a big issue, depending on the specifics of a particular market situation (category "question mark"). For the enterprise IC «Knyazha» 10 basic insurance products were analyzed: transport insurance - product 1; medical expenses insurance - product 2; liability insurance - product 3; property insurance - product 4; cargo insurance - product 5; accident insurance - product 6; insurance abroad - product 7; cumulative life insurance - product 8; financial insurance - product 9; other types of insurance - product 10. The initial data of IC "Knyazha" for constructing the BCG model is given in Table 1. Initial data for constructing the BCG model of IC "Knyazha"
We build a BCG model for IC "Knyazha". Based on the data of table 1, indicators for constructing the BCG model were calculated (Table 2). The BCG model for IC "Knyazha" shows that the company should choose the direction of "growth" for product 1 - transport insurance (Fig. 1). 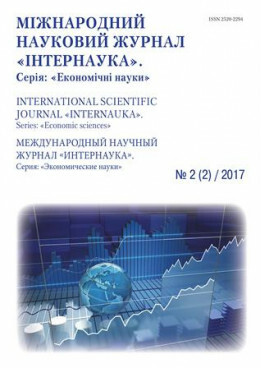 Calculated data for constructing BCG model of IC "Knyazha"
Obviously, a significant part of the model for assessing the competitive environment of the functioning of enterprises requires further economic substantiation of the results. At the same time, unlike other matrix methods, the BCG model reduces the level of subjectivity as a result of using objective criteria for assessing the competitiveness of an enterprise's services and the competitive environment as a whole. Insights from this study and perspectives for further research in this direction. One of the problems of assessing the competitiveness of enterprise services according to the BCG methodology is the information support of calculations, in particular, the definition of the volume of the market, its structuring according to the nomenclature, assortment, objects and subjects of sale. Problems are the information calculations on the competitive activity in the context of individual enterprises, which involve the use of information that is not reflected in the accounting or statistical reporting. When using the BCG method, it is proposed to conduct a survey of a set of competitive environment enterprises in order to assess their competitive position and develop strategic decisions to increase the intensity of the processes of ensuring competitiveness. However, in choosing the direction of development of the model under consideration, the market position of the enterprise, its scientific and technical policy and the stage of the life cycle of products (services) are not taken into account. Altuntas, S., Dereli, T., & Kusiak, A. (2016). Assessment of corporate innovation capability with a data-mining approach: industrial case studies // Computers & Industrial Engineering, 102. – P. 58-68. Budzianowski, W. M. (2016). A review of potential innovations for production, conditioning and utilization of biogas with multiple-criteria assessment // Renewable and sustainable energy reviews, 54. – P. 1148-1171. Malecki, E. J. (2018). Technological innovation and paths to regional economic growth. In Growth Policy in the Age of High Technology (pp. 97-126). Routledge. Van Lente, H., Swierstra, T., & Joly, P. B. (2017). Responsible innovation as a critique of technology assessment // Journal of Responsible Innovation, 4(2). – P. 254-261. Drobyazko S.I. (2016). Features of accounting in private pension funds // Journal "Economics and the State", № 7. - 2016 - P. 67-70. Mnykh M.V. (2017). Competition in the insurance market of Ukraine and the peculiarities of its control. Priority research areas: Collection of scientific articles. - Academic Publishing House of the Agricultural University Plovdiv, Bulgaria, 2017. - 160 р. – P. 79-94.